DawgsOnline » A possible indoor facility compromise – at what cost? A possible indoor facility compromise – at what cost? Discussion of Georgia’s eventual indoor practice facility (IPF) has always come back to this tough choice: do you sacrifice existing outdoor practice fields for the on-campus location, or do you sacrifice convenience to build exactly what you want out on South Milledge Ave? …one site has emerged as a possibility: The area just beyond the existing outdoor practice fields, off of Lumpkin Street, leading up to Stegeman Coliseum. Other locations had not been ruled out as of last month: An off-campus area off Milledge Avenue, or tearing up one of the existing outdoor fields and building it there. But the location off Lumpkin seems a good compromise, keeping the existing facilities but not having it far from the Butts-Mehre building. 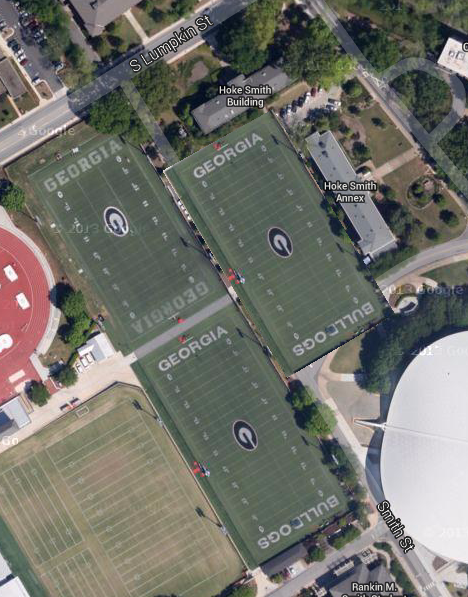 That location, “just beyond the existing outdoor practice fields,” is the block bordered by Lumpkin Street, Carlton Street, Sanford Drive, and Smith Street. It’s the site of the Hoke Smith Building, the Hoke Smith Annex, and a large parking lot that serves the Hoke Smith complex as well as athletic events during off-hours. The location is ideal until you consider the buildings already occupying the site. Displacing typical academic buildings would be a tough enough sales job to the University community. These buildings house the University’s Cooperative Extension Service – essentially the state’s home base for CES outreach and 4H. It’s not as if these services would go away, but relocating them would draw statewide interest. The political cost is just the start. The expense of a new CES location would obviously add to the cost of the practice facility. Would UGA or the athletic department foot that bill? Would there be a way to preserve the buildings? Not realistically. 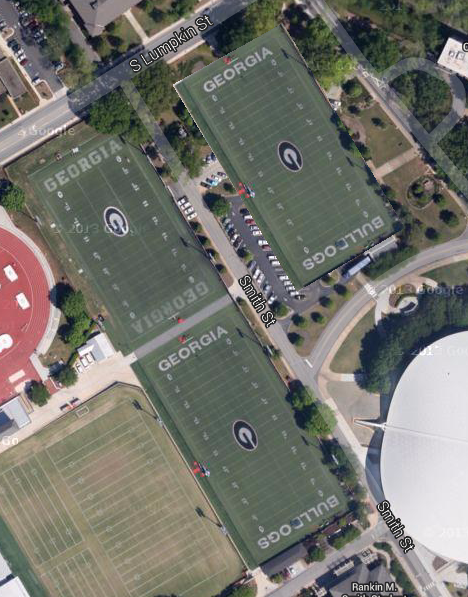 If you try to shoehorn in a facility with the exact footprint of a practice field, the hulking football facility would just about touch the buildings and require the closure of Smith Street and Sanford Drive. And of course the facility will take up more space than the outline of a practice field. So we’re left with this: if you take over the block completely, there seems to be ample space for a full-size indoor field with a nice buffer of greenspace around it. Personally, as someone who attends a lot of events at Stegeman, I’m not looking forward to losing those parking spaces, but that’s something I’ve said every time a new University building goes up. It’s worth pointing out that this solution is just one of several being considered, and we’ll learn more as the board discusses the future facility. Milledge seems like the obvious choice here. I know it’s less convenient, but we’re talking about something the team will use 5-10 times per year. They can’t get on buses and head down Milledge, like they do when they go to Sanford or Ramsey?